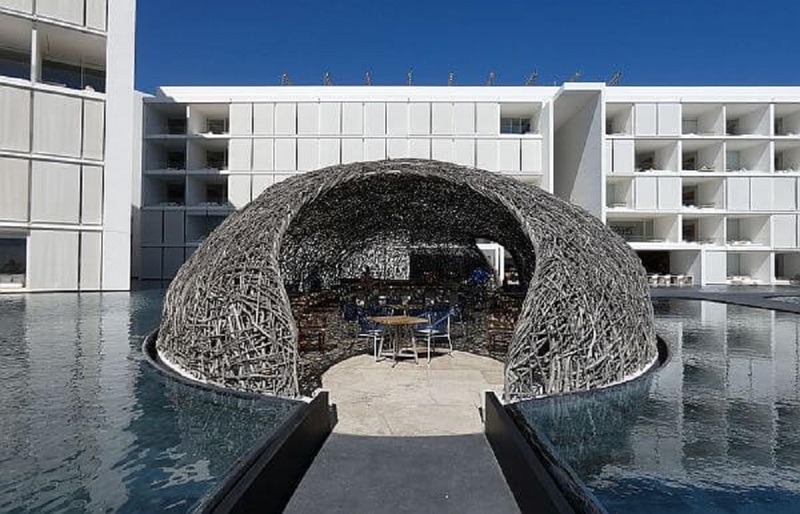 Things are not always what they seem at the new Viceroy Los Cabos resort. This is a new hotel, technically, but it had a brief earlier life as Mar Adentro. That name, “sea inside,” guides the whole design concept here, where white buildings seem to be floating on water and the sea seems to come right up to the rooms and lobby. Sometimes it’s hard to tell where the swimming pool starts and the decorative pool ends. Between the lobby and the sea there are five swimming pools to relax beside, then there are lounge chairs right on the beach when you get down to the waves. Two of the pools, a restaurant, and bar are right by the beach as well, so you don’t have to go very far for anything once you get there. This is an unapologetically modern resort, nearly every surface painted white, with the accents usually being gray. It’s all clean lines and boxy angles except for the curve of the pools and the two upside-down nest structures that house bars by the largest pool and the beach area. At night though, colored lights on the walls add some liveliness and in the dining areas there are more splashes of color. 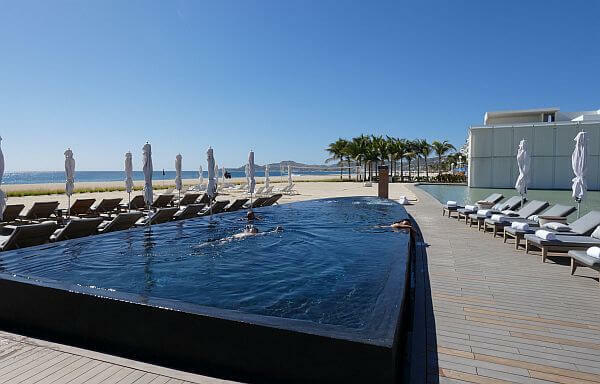 Wellness is the big focus here though at the Viceroy Los Cabos. There’s a very California aesthetic in place, with lots of healthy dishes on offer, a preponderance of organic food, and as many locally sourced ingredients as they can find in this desert environment. Naturally there’s plenty of seafood, especially at the roof deck restaurant. The fitness center is a thing of wonder, with just about any piece of equipment a gym rat could desire, all in new condition. There are also regular classes offered at no extra charge. This resort might be a place where you actually lose weight on vacation. If you get worn out and need a break from the sun though, there’s an intimate movie theater as well. There’s an extensive spa on site, with a whole range of water features, an ice bath, and a range of treatment rooms. Rooms are tricked-out with the latest gadgets and present the same mostly white aesthetic. Those whose tasted run to the ultra-contemporary will be thrilled. If you’re looking for reminders you’re in Mexico though, this may not be the best choice in the tourist corridor of Baja. Speaking of such, this Viceroy does have a great location for guests who want to do more than stay put at the resort. It’s biking distance to downtown San Jose del Cabo, with its galleries, bars, and restaurants.